Well, the other day, I made some homemade Fig Jam and as much as I love it, I am the only one eating it, as my husband doesn’t really eat jam. So, I decided to make the one fruit cookie I know he would eat. Fig Newtons! Now I am not a huge fan of Fig Newtons from the store. The cookie always had a processed taste and the filling was always too sweet for me. So, needless to say, I was apprehensive about how these cookies would taste. The first indication that I knew I would love these cookies was the smell coming out of my oven. WOW, I wish I could bottle it and spray the house with it every day. I think I just might have to make a batch everyday, the smell was incredible! 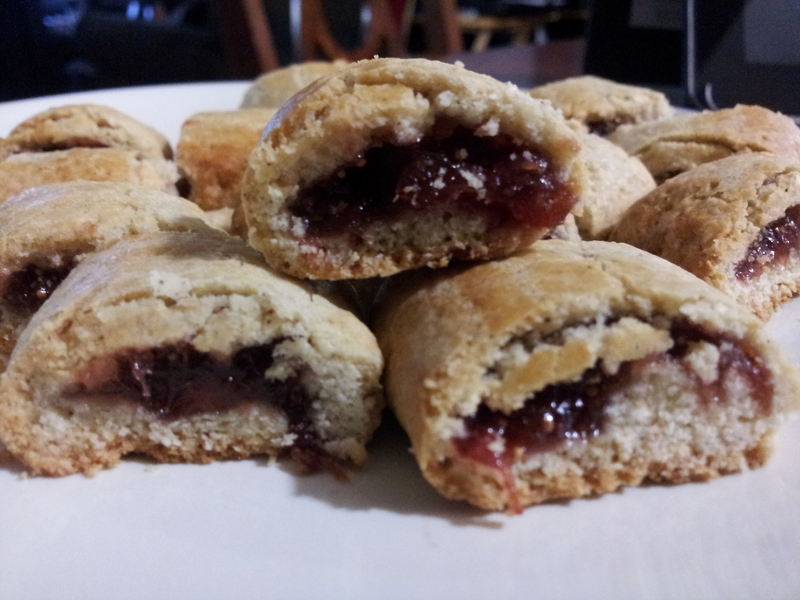 I highly recommend making your own Fig Newtons. Hey, if you want, you can even change it up by using different preserves. Tomorrow, I think I will try Apricot. I used about 1/2 my dough and made 16 small cookies. Place all the dry ingredients in a bowl (or food processor). Using a fork/pastry blender/food process, cut butter until the dough looks like sand. Wrap dough in a plastic wrap and refrigerate for 2 hours. On a well floured (I do mean well floured) surface, roll out half the dough into a large rectangle (5 inches wide). If you don’t have the dough floured well, you will have difficulty as this dough is sticky. In the center of each strip, place your fruit filling. Fold the long sides of the strip over the filling, making a long tube. Close the ends. Place the cookie tube, seam side down on a parchment covered or greased baking sheet. Allow cookie to cool for at least 10 minutes before cutting into 1 inch pieces.